Jimmy is joined in studio again by frequent guest co-host and all around good pal Jon Hoche! The boys talk about the Shazam preview, the finished Heart mini-series by Blair Butler/Kevin Mellon, the TMNT movie, and the pending lawsuit against The Daily Show for using "CNI" in a report. Jimmy is finally getting some interviews up at Stated Magazine and he officially booked his UK trip to cover Bristol Expo and Kapow Con. New includes: WHO's Jenna-Louise Coleman?, Fringe will have a 5th season, Battlestar Galactica: Blood and Chrome update, and UK Being Human gets another series. As always, listener feedback, the Top 3 and more! Leave your iTunes comments! 5 stars and nothing but love! Jimmy is joined in studio again by frequent guest co-host and all around good pal Jon Hoche! Jimmy finally joins XBox Live and immediately gets addicted to Peggle. As well as the new Draw Something app on his iPhone. Be forewarned: There's a lengthy SPOILER FILLED review of The Walking Dead season 2 finale. News includes: IDW announces a slew of new titles, will The Ponds survive Doctor Who after all?, Chris Hardwick's new Nerdist YouTube channel announces line up, Felicia Day's new Geek and Sundry YouTube channel announces line up, Punisher in Space, new Captain Marvel from Marvel and Brian Wood is all about the X-Men. And for some reason, there's a lot of Shakespeare influenced stuff talked about this episode. ZOUNDS! As always, listener feedback (with a great guest suggestion), the Top 3 and more! Leave your iTunes comments! 5 stars and nothing but love! Comic News Insider: Episode 390 is now available for free download! Click on the link or get it through iTunes! Sponsored by Dynamic Forces. Jimmy is joined in studio again by frequent guest co-host and all around good pal Jon Hoche! Lots of bourbon was consumed so it was pretty off the rails from the beginning. The boys talk about their appearance on Comic Book Club last week and discuss some of the recent Marvel teasers released. News includes: RIP Moebius, Marvel ReEvolution, Lionsgate brings Nic Cage comic book theft to film, The Walking Dead Facebook game, an Archie game for mobile devices, and a Pokemon champ loses his title for a "crappy" reason. As always, listener feedback, the Top 3 and more! Leave your iTunes comments! 5 stars and nothing but love! Comic News Insider on Comic Book Club! At the last minute, Pete LePage of the Comic Book Club (CBC) podcast contacted me and asked me to come on their live show Tuesday night! It was mere hours before I was about to record my own podcast, Comic News Insider (CNI). My good pal Jon Hoche was coming over to co-host so I asked Pete if we both could do it. He said sure! I asked Jon to come over early and after recording CNI 389 (available tomorrow), we rushed down to The PIT (People's Improv Theater). My good friends Grace Helbig and Lorraine Cink perform there all of the time so I was familiar with it. If you don't know, CBC records their podcast live every Tuesday night in front of an audience in the small black box theater at The PIT. (Though they are soon moving to Pianos to start recording the show as a videocast as part of The Nerdist Network). I wasn't sure what to expect as I never attended in the past. Always wanted to go, but we record on the same nights so it made it impossible. We got there right at 8 as it was about to start and the guys quickly went over what the show was about. Oh, the guys being the CBC hosts. Pete LePage, Justin Tyler and Alex Zalben. All funny and nerdy guys. Just like me! It was a modest audience in the thousands (okay, only about 10 people were there) but they were great and laughed a lot. Had I had more notice to promote me being in it, I'm sure I could have gotten a bunch of friends to attend. You all would have come, right? RIGHT?!!! Anyway, it was a lot of fun and we all riffed off of each other pretty well. We talked comics, some of the big stories of the week, gave out prizes and laughed a lot. I'll definitely have those guys on CNI in the future and they said they'd love to have me back on. UNLESS THEY LIED! Nah, they ain't liars. But they sure are funny folks! Here's the blurb from their page about the show. Now go listen! 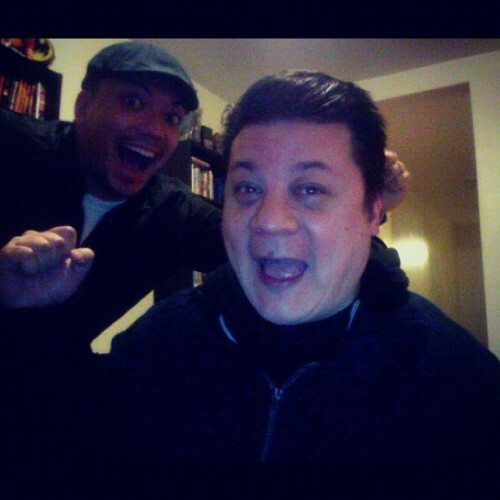 Jimmy Aquino (Host, Comic News Insider), and frequent guest Jon Hoche (Vampire Cowboys) guest for a special crossover episode! Plus, if you’re from Houston, you’re not going to like us after this week. * Big spoilers for this week’s ‘The Walking Dead’ as T-Dog finally gets half a line. * ‘The Avengers’ trailer has finally hit online… Do we love it, or REALLY love it? * We pour a badly CGIed 40 on the ground for the passing of ‘Terra Nova’.